Looking at first and second down for quarters one through four, you can see that the distributions all have roughly the same shape: unimodal, centered around 4.5 yards with some right skew. Peterson’s rushes on first down tend to be longer on average, and he sees the highest average yards gained on first down in the fourth quarter. His lowest average yards gained on first down is in the first quarter. Logically, this makes sense as defenses expect more rushes on first down in the first quarter than they would in any other quarter. On second down, we see that AP fairs well across all quarters and overtime (although overtime has many fewer data points). Specifically, second down in the second quarter is where Peterson thrives. He averages 5.33 yards per carry and as of last season has 23 rushes over 10 yards in this situation. 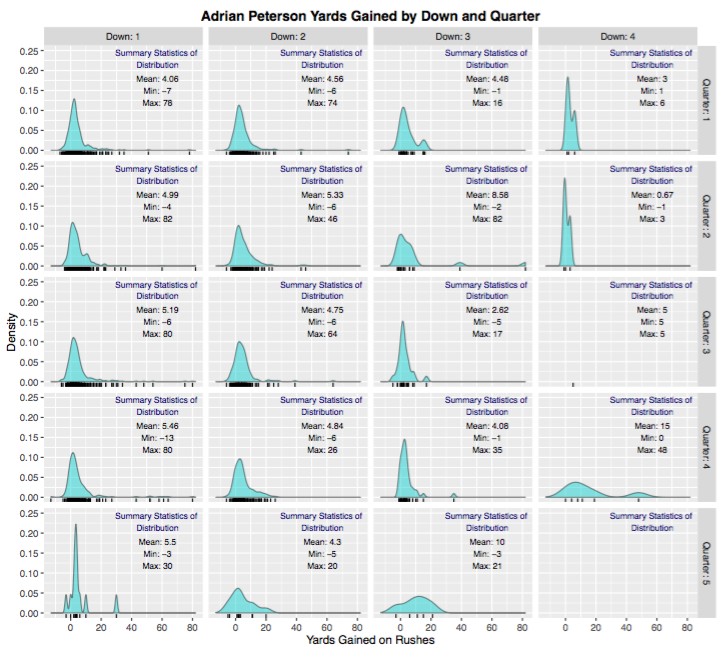 Just looking at the second column of graphs in our plot, we see how effective Peterson is on second down. This is something to hold onto for later! On the whole, Peterson has fewer rush attempts on third down, which again makes sense. According to the data collected from nflscrapR, teams pass 52% on third down compared to running just 37% of the time (the remaining 11% is accounted for in punts, penalties, and field goals). His average yards per carry on third down vary the most on third down. He averages a whopping 8.58 yards per carry on third down in the second quarter, compared to just 2.62 yards per carry in the third (note the 8.58 yards per carry value is skewed by an 82 yard run). The difference here may have to do with Peterson’s opportunities. In the second quarter, he may be running in a lot more hopeless third and long situation and gaining lots of yards while in the third quarter, he may be running on a lot more third and short situations trying to just get a first down. Play sequencing may also come into effect which is something to look at in tandem with the graphs below. For example, play sequencing could tell us that many of Peterson’s third down runs in the third quarter are preceded by running plays, and thus the defense is expecting the Vikings to run again. Fourth down is in its own category. Since 2009, AP has just 13 carries on fourth down. When he does run on fourth down, his team is often in fourth and short situations hence why the observed yards per carry values are small across quarters. With such a small sample size, it’s hard to drawn valid conclusions for runs on fourth down so let’s move on. Limit the number of first down rushes in the first quarter. Although this is a common trend, AP averages about 1 yard less per carry on first down in the first quarter than in any other quarter. Second down is where Peterson shines, especially in the second and fourth quarters. I would recommend calling more running plays on second down in the fourth quarters to keep the defense off balance and honest against the run in the hope that it leads to more opportunities in the passing game. According to Football Outsiders, teams convert more third and short situations when running the football so I recommend that the Vikings utilize AP on third and short more often. Again, running on third down will keep teams honest and could open up holes down field for the passing game off of play-action passes.